In its essence, Sunday's question is one of dignity and our lives from this point on. A 'NO' demonstration in Athens. Demotix/Alexandros Michailidis. All rights reserved.Sunday's referendum vote is not about one fiscal detail or another, a bad agreement or one that is less so. In its essence, Sunday's question is about dignity and our lives from this point on. It is about the dignity to do away with the criminal gang-in-suits that has made even the otherwise despicable face of political power appear well-intended and innocent. And it is a question of whether we (as individuals, not as this weird idea of “a people”: more on this in a second) want to continue living a life of excruciating uncertainty, never-ending ultimatums and emergencies, of humiliation and sorrow. It is a question those of us lucky enough to have made it to the ballot box will have to answer for those who didn't make it. This is why, should the referendum go ahead, I will be casting a vote, for the first time in my life. I will be voting for my friends and family chased away and denied the capacity to live over here. I will be voting for my dear friend who decided, in the darkest hours of the crisis, that his was a life not worth living. I will be voting in the hope that doing so will help make the lives of the criminal market gang truly unlivable. As an anarchist, I have no faith in the system of electoral representation, nor do I have the will to surrender my political demands to any leader, for any amount of time. But this is not what this referendum will do. Should this be a well-orchestrated plan on the side of Syriza to let people swallow the austerity medicine, their bluff is already called. Sure enough, a 'no' vote on Sunday doesn't guarantee that yet another austerity programme won't follow. But we'll deal with that if and when it comes. And sure, in voting 'no' we have no idea what we are actually voting 'yes' to. But I have a pretty good idea who my 'no' will go out to. This 'no' will go out to the market, this ubiquitous force we have allowed to permeate even the most intimate of our spaces, even the innermost, the core foundations of our existence. It will go out to the parasite scum in suits and ties, the priests of the banking orthodoxy and their pompous, arrogant belief that they can keep running the show, for ever. No, you can't. 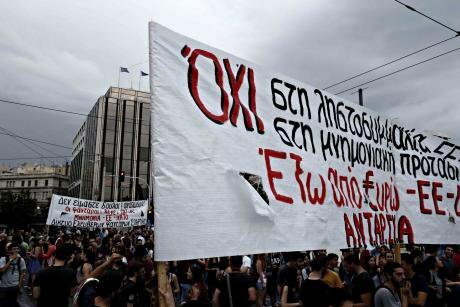 It will go out to those fueling nationalism in Europe, it will go out against Syriza's invocation of a Greek “people”. Is there such a thing as a “people”? Of course not; I am not sure what the idea even means. Where does any such commonality lie? Is it in the language that we speak? In the spaces that we inhabit? Are our interests in any way compatible, let alone common, with the parasitic scum sucking the blood out of our very lives? The Left on these shores, and in the continent as a whole, will be historically liable for putting this idea forward, for fueling nationalisms, for helping form an environment in which the most despicable of far-right ideologies can thrive. Our commonalities do not lie in language, our bonds do not depend upon our physical proximities. Not too many years ago, we succeeded in developing an anti-capitalist movement on this continent based on this understanding: we were on course in creating a political consciousness of Europe as a common space. This 'no' is a homage to our common anti-capitalist, anti-authoritarian legacy, one that was crushed in this landscape of permanent emergency and market rule. This is when we start re-imagining our cross-border commonalities and interests, this is when we expose our enemies within and beyond borders for what they are, this is when we bring down the facade of the market and national unity. And it all starts with this 'no'.